So, yes, as you may have gathered by now, I stalk people. Now, don’t judge me, just yet. Don’t tell me you have not used Facebook to do a full ‘social’ MRI on someone you like/dislike. It’s legitimate. Perfectly! Maybe you are missing someone; maybe he/she is supposed to be with you or maybe, you want to him/her to like you – go ahead, USE social media to capitalize on the information that lies before you. 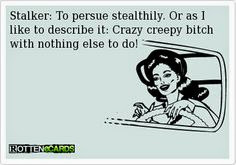 I admit I have used stalk-ledge (stalker knowledge) to perhaps gain ‘advantage’ of those whom I may like. For example, he posts a song via YouTube of a band you have never heard of with ‘Best song eveeeerrr’ – you would quickly run a Wiki search on the band; familiarize yourself with a few of their songs. You meet him and casually drop the conversation to music, and mention how much you like X band and BAM! – you’ve got the mother of gold stars. Remember, knowledge is power. I think Spiderman said that. Or maybe it’s a girl you like; you have been relegated to a painful Friendzone relationship where you have even helped her shop for silk boxers for her boyfriend. Gather ‘information’ about her – are her Facebook status updates letting you know that her man does not pay enough attention to her; does she post quotes about ‘love is not easy, but I try’ or does she post songs about how she doesn’t feel loved? BINGO, this is your captain of You're-about-to-get-laid speaking – land of opportunity lies ahead of you. As always, I treat you to a real life story about the subject in concern: I knew of this ‘amazing’ couple – they were made of unicorns, cupcakes and Do It Yourself projects. Everyone thought they’ll be married. Unexpected rows lead to a breakup and as rumor has it, the two individuals never stopped loving each other, although they both found partners subsequently. Years after, he would know her life as it is because he would begin his day by checking her Facebook status, his lunch breaks were shorter because her Instagram feed was more important. He knew every major event in her life and saw her lead a pretentious ‘I’m happy’ life with pictures of her with friends at clubs. He would laugh at her quips on Twitter and adore her feminist display picture on WhatsApp. Remember how when we were in school and we were constantly asked to ‘seek’ knowledge – to gain insights to broaden our senses? I think I’m finally putting this in to practice! I am indebted to the creators of Google Chrome who allow multiple windows to be opened simultaneously to allow serious stalkerdom. There was one time when a person I liked would reply my texts 2 days later proffering excuses of conference calls, meetings in an apologetic tone and was simply too busy to reply a ‘Hello, how’s it going’ text message. Evidence retrieved on Facebook showed me multiple status updates, including cricket match score updates; ALL updated using ‘mobile’. Thank you, social media for helping me plough the weeds prematurely. Just so we are being open here, I have even stalked a boyfriend’s ex-girlfriend so hard I was insanely jealous and even started despising her and dropping snide comments about her. I even wanted a black tee shirt because she owned one and looked effortlessly chic. So back to more serious business, there’s a pool of knowledge out there. The inventors of such media wanted it to be used, productively. On a serious note, hasn't social media helped you evade disastrous encounters? It's okay to not admit to this aloud but we have all had a fair share of digital stalking. At this rate, I could easily be heading a department of criminal investigations in online activity. Swallow your pride, do the dirty work now to save yourself from weeks of ice cream binges, I know I have!